After dropping a heart breaking 5 set match to 3rd place Nashua North on Friday the Varsity rebounded Monday night to take a 3-0 victory over Nashua South. 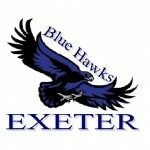 At 5-2 and holding 7th place in the standings, we are off to one of the best starts for Exeter Volleyball in recent years. We also hold a win over 5th ranked Goffstown so we know we can challenge with the best! Make no mistakes, there is a tremendous amount of parity in Division I this year so all matches from here on out will be challenging; something the team has discussed and is ready, willing and able to embrace! No matches this week UNTIL… The big match AT Winnacunnet on Saturday. JV plays at 10:00 am and Varsity will follow directly (around 11:15 – 11:30). Bring the fans and bring the noise!!!! Enjoy the Week – Go Hawks!